Food security is an important indicator of poverty status in Lao PDR and therefore an objective of development interventions. Classification of food security on the basis of rice security, without appropriate consideration of the availability and quality of other sources of food, can lead to inappropriate characterization of communities. Food security does not relate solely to quantity of food, but also to nutrition and health. People acquire food by cultivation, gathering wild food, barter and buying from local markets. This study provides insights into food availability and consumption among households in terms of diversification and frequency and highlights the importance of both rice and aquatic animals. Glutinous rice (sticky rice) is the staple food. Some Gayeu residents also eat non-glutinous (ordinary) rice in combination with sticky rice because they can grow it. Farmers said that normally they do not produce enough rice for consumption, and rice shortages always occur for about three months around the time of planting. The situation becomes worse if insect infestations, disease outbreaks and floods are heavier than usual. They reported that the recent shortage period was from April-June in Gayeu and September-November in Saisi. When facing chronic food shortages, community members adopt a variety of coping strategies. For instance, some reduce the amount of rice consumed, while others search for alternative sources such as wild yams, taro, cassava, and other roots. In vulnerable families, people may eat only wild yams or roots collected from the forest. Overall, the poor and better-off have access to similar types of caloric sources (glutinous rice, ordinary rice, cassava, sweet potatoes, taro, wild yams and roots), but better-off family members tend to eat these foods more often. The villagers consume animal protein from several sources. Domestic animals (poultry, eggs, pork and beef/buffalo). People only buy meat occasionally since it is expensive and it is difficult to get to markets. However, chickens raised in the backyard (and their eggs) are relatively common compared to other sources of protein from domestic animals. Communities have access to a diverse variety of cultivated and non-cultivated foods, but supplies are uncertain largely due to low productivity, especially for rice. Animal and vegetable groups are plentiful since these are readily gathered from wetlands, major water bodies and nearby forests. The diets of most community members are not adequate nutritionally, partly because they are low in fat. In addition, insufficient knowledge about proper storage and handling reduces the amount of iodine available in salt supplies. Overall, aquatic animals are a substantial part of the food supply in these three communities compared to cultivated items (except rice). Food acquisition is limited by several major factors including low purchasing power, labour, time, food preference and health status. The term aquatic animals mainly refers to fish, eels, frogs, freshwater shrimp, snakes, snails and turtles. Several types of fish are available in these villages. In this study, snakehead (Channa striata) is used as a reference fish because of its popularity as a household food and as an item for sale, both in Attapeu and throughout southeast Asia. Food security does not relate solely to quantity of food, but also to nutrition and health. The people in this study feel that a snakehead is large if it is more than 5-6 inches long. Large snakeheads are almost always sold whereas smaller ones are eaten by the family. By many regional standards, a snakehead 5-6 inches long is considered quite small. It would seem that only the small fish are retained for household use. The findings also reveal that aquatic animals contribute substantially to household food supply in terms of diversity and frequency of consumption. Other animals collected from the wild include ant eggs, crickets, locusts, bees, hornets, monitor lizards, and rats. These are available seasonally and play a significant role in the diet of community members. Food preservation is a practical way to store food and cope with seasonality, food shortages and vulnerability. The researchers found that the villagers use short-term fish preservation methods such as sun-drying, as well as longer-term methods like fermentation and salting. Fish prepared using short-term preservation techniques can last 5-10 days, whereas long-term fish preservation can extend availability for the entire year. In many cases, those who make fermented fish (pa dek) said that it is no longer adequate for an entire year, since the fish used in the preservation process are declining in number. Pa dek is considered a condiment and supplies only a small amount of nutrients. Nevertheless, some community members, especially the poor, may cook pa dek as a main dish. 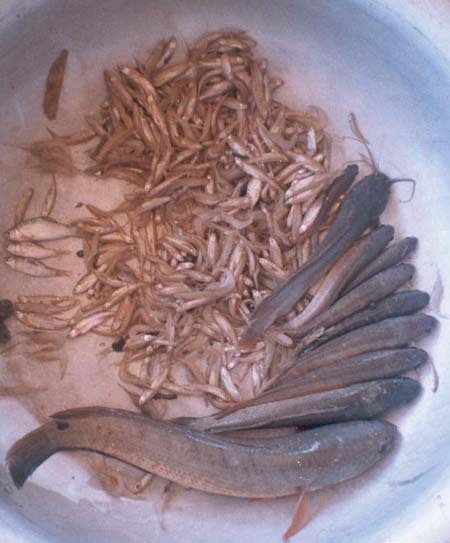 Salted fish (pa katoaw) is prepared using tiny fish soaked in saturated brine or by mixing them with salt. When the flesh hardens as the salt saturates into the flesh, the fish are packed tightly in bamboo sections. One respondent said that five bamboo sections (6 cm in diameter and 40 cm in length) of pa katoaw will supply the needs of a family of six for an entire year. Since 1997 the Lao PDR government has been enforcing laws to conserve wildlife, which may lead to under-reporting. Hunting is seasonal and at the time of the study people were not hunting. Since hunting is a male occupation, in households without a capable hunter, wild meat may be rarely eaten. For those families living in areas where foods are diverse, they may choose to obtain more readily accessible foods from water bodies, wetlands and bushes. It is questionable whether wildlife is still abundantly available for hunting, as many respondents noted declining populations. There is a relationship between food behavior and food acquisition (see Figure 1). No matter what foods are available in the communities, those who prepare foods for the family will choose what the family eats. Some interviewees mentioned that they do not like to eat meat from wild animals. Leafy and non-leafy vegetables cultivated in these communities include lettuce, cabbage, mustard greens, morning glory, water mimosa, wax gourd, cucumber, string bean and pumpkin. Garnishing vegetables such as spring onions, coriander, sweet basil, sacred basil, lemon grass, chilli and other dills are planted in small areas close to houses. Many families grow these vegetables for income. Uncultivated vegetables and fruit from trees are commonly consumed. Those grown in semi-wetland areas and available all year round include pak kadon, pak kayang, pak samek, pak tiew, and pak paew. Bamboo shoots and mushrooms are seasonally available. Common (un)cultivated trees around the backyard are yod gatin, lin mai, mango leaves and tamarind (leaves and pods). According to food frequency data (see Annex 1a) aquatic plants are important household foods. Based on observation data, in poorer families women collect these plants and prepare them as the main meal. 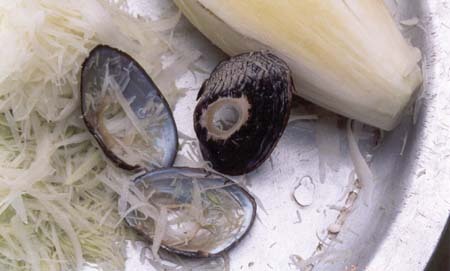 In other families, they are eaten in combination with other foods or for dipping in chilli sauce. Organized by the Food and Agriculture Organization of the United Nations and the World Health Organization, Rome, 19 to 26 October 1993 (M-80 ISBN 92-5-103621-7 © FAO 1994). Adults: Adequate amounts of dietary fat are essential for health. In addition to their contribution to meeting energy needs, intakes of dietary fat must be sufficient to meet requirements for essential fatty acids and fat soluble vitamins. The minimum intake consistent with health varies throughout a persons life and among individuals. Adequate intake of dietary fat is particularly important prior to and during pregnancy and lactation. Increasing the availability and consumption of dietary fats is often a priority for overcoming the problems of protein-energy malnutrition. Recommendations to populations concerning desirable ranges of fat intakes may vary according to prevailing conditions, especially dietary pattems and the prevalence of diet-related non-communicable diseases. For most adults, dietary fat should supply at least 15 percent of their energy intake. Women of reproductive age should consume at least 20 percent of their energy from fat. Concerted efforts should be made to ensure adequate consumption of dietary fat among populations where less than 15 percent of the dietary energy supply is from fat. Infants and young children: Both the amount and quality of dietary fat consumed can affect child growth and development. These influences are mediated through energy levels and through the action of specific fatty acids and various non-glyceride components of the fat. Breast-milk provides between 50-60 percent energy as fat, and during the weaning period (that is, the transition from full breast-feeding to no breast-feeding) care needs to be taken to prevent dietary fat intakes from falling too rapidly or below the required levels. The use of fat, especially vegetable oils, in the foods fed to weaning infants and young children is an effective way to maintain the energy density of their diets. The consumption of adequate amounts of essential acids is also important for normal growth and development. Arachidonic acid and docosahexaenoic acid (DHA) are particularly important for brain development, and breast-milk is a good source of these fatty acids. Particular problems exist for pre-term infants who had an insufficient intra-uterine supply of arachidonic acid and DHA and who were born with low fat reserves. Infants should be fed breast-milk if at all possible. The fatty acid composition of infant formulas should correspond to the amount and proportion of fatty acids contained in breast-milk. This food group is not included in Table 4 (page 24) because respondents rarely acquired food rich in oil. Moreover, vegetable oil is not purchased, and lard is only rarely used to prepare omelets for children. Coconut milk dishes are prepared for certain ceremonies, and most are sweet rather than savory. One of the reasons for limited vegetable oil consumption is that Lao PDR does not have an established grain pressing industry. Vegetable oil is mostly imported and when it reaches remote rural areas it is prohibitively expensive. Rendered pork fat is more commonly used, although again, this is a relative luxury. Traditional menu items do not have a great deal of fried food. Fruits are acquired mainly from the market. A few varieties are grown around the house, most notably, mango, jackfruit, custard apple and tamarind. Wild fruits were rarely mentioned in focus group discussions or individual interviews. As a source of iodine, salt is an important daily consumable item, while seafood is rare. Communities obtain their salt supplies from domestic factories (Champassak Province) and Viet Nam (according to the labels on packages). There are two forms of salt: fine and coarse. Fine granular salt is used for cooking, while coarse granular salt is used for preserving food. However, since coarse salt is inexpensive, several respondents reported using it for cooking as well. As part of this study, the quality of both forms of salt was tested using a semi-quantitative screening test kit (Department of Biochemistry, Mahidol University). Results showed that 32 percent of household salt samples (n=37) had insufficient iodine content (below 30 ppm). All coarse salt samples had low iodine content whereas fine salt showed variable levels of iodine content. The major factor affecting salt quality is improper handling and storage. When newly opened salt packages were tested, their iodine content was adequate, ranging from 50-100 ppm. Once the packages are opened, they are kept in open containers and the salt is exposed to air and light. Thus, the iodine content decreases to an unacceptable level and the quality of the salt becomes low. Community members generally eat three meals a day. Breakfast is early because of farm work. During farming season, poor people will merge breakfast and lunch into one meal. When farming activities slow down, lunch is optional. Eating between meals is rare. Dinner is taken at dusk or sunset when family members come back from farm work or from work outside their homes. People eat glutinous rice as their main source of calories, though as noted earlier, Gayeu villagers consider ordinary (non-glutinous) rice as part of their daily food. Glutinous rice is steamed for breakfast because it does not take long to prepare. After cooking, it is packed into rice baskets and carried to work or school for lunch. Leftover rice is also eaten for lunch. Explanations regarding the reduced number of meals or eating glutinous and ordinary rice together in daily meals reflects food insecurity. Merging breakfast with lunch or making lunch optional is a mechanism by which people can conserve their rice supplies, particularly in times of shortage. Another strategy to overcome rice insecurity is seen in the pattern of eating ordinary rice for dinner. After cooking, the volume of ordinary rice increases to a greater extent than glutinous rice. Using a manual for estimating dietary intake as a guide (Banjong, et al. 1995), 1 000 grams of ordinary rice is converted to 2 325 grams of cooked rice, whereas 1 000 grams of glutinous rice increases to only 1 515 grams. Gayeu residents always prepare ordinary rice for dinner, which helps them conserve their supplies of glutinous rice for use during times of scarcity when a larger volume of rice might be needed (April to June). Gayeu residents use this practice as a regular coping technique the entire year. This same coping strategy is also found among many Saisi families. Home visits to selected households allowed the investigators to learn about peoples food habits and consumption patterns. Based on the Thai Food Composition Database (INMU, 2002), calories obtained from rice intake were estimated during these visits. The results highlight important food habits and food insecurity found in the study areas as shown in the following cases. Overall, the habitual diet of community members is comprised of steamed glutinous rice and jaew, a sauce made of raw fermented fish mixed with chili, MSG and condiments. In addition, fish, frogs, snails, crabs, lizards and other animal meat (if available) may be added. This dish is eaten with vegetables, commonly collected from swamps, wetlands, other water sources and nearby forests. On some days, if fish or animal meat is sufficient in quantity to prepare soup, then soup would be an additional dish to jaew. Although the total diet could not be completely assessed, estimated caloric intake measurements indicate that the main source of calories is from glutinous rice supplemented with ordinary rice in Gayeu and some Saisi families. Absolute intake of calories in terms of quantity may meet daily requirements most of the year. Quality is most likely deficient, especially in some important micronutrients such as iron, iodine and vitamin A. There are several reasons for this assumption. First, only a few dishes are prepared at one time, and many people must share only a small amount of food. In some cases, food beliefs restrict what foods some family members can eat and some of these foods are rich in micronutrients such as vitamin A. Finally, little animal meat is eaten, which can restrict the bioavailability of micronutrients contained in rice and plant foods (Bouis and Hunt, 1999). The recommended daily caloric intake from carbohydrate, protein and fat should be in the proportion of 60 percent, 10 percent, and 30 percent respectively (Guthrie and Picciano, 1995). People in these communities consume low amounts of fat, if any at all. As a result, fat-soluble vitamins, most notably vitamin A, cannot be adequately absorbed by the body, which in turn compromises the bodys immune system. Micronutrient deficiencies due to low animal food intake can lead to the risk of infection (Halstead, et al.1967). Community members equate food with rice and therefore anxiety sets in only when rice is scarce and means must be found to obtain more of it. All respondents rely significantly on uncultivated foods, especially aquatic animals and plants as major food sources. These foods, however, are only seasonally available or may be declining, and obtaining them is limited largely to non-farming seasons. Furthermore, community members do not place an emphasis on the cultivation of diverse food sources and their storage, preferring to collect foods from the wild (especially yams) when they are immediately needed. Both poor and better-off families have similar dietary patterns with inadequate dietary intake leading to nutrition insecurity for both groups. Consequently, the criteria used by focus group participants to classify households into worse-off and better off are not adequate for determining differences between groups in terms of food and nutrition security. It is possible that knowledge about food and nutrition may be a more important criterion for determining dietary intake than economically-based characteristics. Nutritional status during pregnancy is extremely important. Dietary intake influences pregnancy outcome and lactation (WHO, 1989). The findings from this study indicate that mothers did not eat for two but continued to eat the same foods (in quantity and quality) as before they were pregnant. Almost none of the pregnant women observed in this study attended antenatal clinics. Many mothers realized they were pregnant only three to five months after gestation. When asked about their interest in antenatal clinic services at the hospital, mothers said that only sick people go to hospitals. If a woman is having a healthy pregnancy, then she does not need to see a doctor. Among other things, this perception limits womens access to health and nutrition information. Mothers said, Only sick people go to hospitals. If a woman is having a healthy pregnancy, then she does not need to see a doctor. During the first one to two weeks following birth, food restrictions are strictly adhered to. The mother eats only rice with salt, though a few women may be given baked chicken or fish. Food restrictions continue for one month or longer. Prohibited foods include certain types of animals, vegetables and fruits. For animals, red meat (like blood) is strictly prohibited as are red-tailed fish and red fowl. Wild pig, barking deer, rabbit, albino buffalo, toad, some kinds of fish and fermented products are other examples of the types of foods considered taboo. Fruits and vegetables believed to deprive a woman of her health are watermelon, sour fruits and pickled foods. They also avoid spicy dishes and monosodium glutamate (MSG). These foods are believed to cause headaches, vomiting, severe bleeding, loss of consciousness and convulsions, inflammation to the womb, and eventually death. Some items are believed to enter the breast milk and cause diarrhea and fever in the baby. Members of poor families and those who have had an infant die are among those who most strictly adhere to food restrictions. Special foods to promote health are rare. Foods believed to be nourishing for breast milk production are banana flower, young jackfruit, bitter foods and specific tree roots. Foods prepared in the form of soup are favorites, especially jackfruit soup and soups made with bitter foods. Apart from food practices, nourishing the body using herbal medicine is encouraged. Herbal recipes consist of herbs collected from bushes or the forest, and are usually taken in the form of tonic drinks or for bathing. Home births are often attended by Traditional Birth Assistants (TBA). Though they have received training, their skills are not sufficient to change traditional feeding practices. Although all newborns are given breast milk, almost none of the infants observed were given colostrum. Mothers believe that because colostrum is not white like breast milk, it is not ripe and should be discarded or it will cause diarrhea in the babies. During the few days that it takes for a mothers breast milk to begin flowing, a mother will feed her infant with chewed rice and a mixture of water and banana. Some mothers said they fed rice to their babies as early as a few hours after birth because the infants cried. Exclusive breastfeeding in which a baby is fed only breast milk for four to six months was definitely absent from the study communities. An early study by Valyasevi et al. (1967) showed that feeding chewed glutinous rice to infants less than 30 days old causes protein intake deficits because calories from rice replace calories from breast milk, even to the extent of one-half of the total daily requirement. In summary, culturally-based food consumption patterns and restrictions are common among the respondents. Most importantly, nutritious foods that lactating women need to regain their health and improve the quality of their breast milk are prohibited, such as animal meats. This is complicated by the fact that these foods are not easily available or not eaten as part of the habitual family diet. Consequently, the health of mothers and their young children is compromised. Mothers do not receive ante-natal care and home births are common. Women have poor access to proper health services. TBAs are the only health care providers available in these areas. In a remote area like Tomoyot, TBAs are poorly trained, which may partly explain the high prevalence of miscarriages and child mortality. Although trained TBAs are available in Gayeu and Saisi, it is uncertain whether their skills and supportive equipment are enough to enable them to save mothers and infants during difficult births or when they have postpartum complications. Their nutritional knowledge and care for mothers and infants during the postpartum period is inadequate to support maternal and child survival. Children are not given regular immunizations (if any at all), thus making them susceptible to preventable childhood diseases. Traditional beliefs and taboos about foods suitable during pregnancy and lactation lead to mothers being malnourished during pregnancy, thus making them susceptible to infections. Frequent pregnancies drain a mothers nutritional resources and cause further malnutrition, which increases the likelihood of low birth-weight, delayed development and infant mortality. Local perceptions about health care services prevent them from learning about health, food and nutrition. As a result, traditional practices persist. In these three communities, no single factor causes poor health in mothers and children. Rather, the problems are complex, multifaceted and interrelated and will require an integrated approach that takes into account the socio-cultural context. Quantitative findings contribute further to the picture of poor health and the many illnesses that community members face. Almost half (45 percent) of the people from participating households reported that they are frequently ill. Infections of the digestive system are prevalent among both men and women. Gastritis was reported among adults and diarrhea among children. Malaria is common, especially in Tomoyot and Gayeu. Respiratory tract infections are widespread and coughs, colds and fever are common among children. Pulmonary diseases attack adults, partially because of tobacco smoking. Women complained about sickness that causes vaginal discharge and uterus pain. Health problems caused by poor personal and environmental sanitation and hygiene (e.g. skin diseases, head lice, intestinal parasites) appear not to be dominant at the individual level, though they were reported during group discussions. For non-infectious diseases, except kidney stones, nutritional deficiency signs were not clear. However, paleness of nails, eyes and skin were seen in children who were thin and underweight. Fatigue and numbness, which may be caused by vitamin B deficiency, were evident among women of reproductive age. Four mothers said that their children aged 9-11 years had failing eyesight at night, a symptom associated with night blindness due to vitamin A deficiency. Apart from the reported data, the home visits allowed the researchers to observe the health status of young children. Some exhibited angular stomatis, dry hair and were extremely thin, though their mothers did not recognize these as signs of nutritional health deprivation. The nutrition status of 0-18 year old children was categorized as either underweight, stunted or wasted. Underweight rates of 40.3 percent, 50.3 percent and 44.8 percent were measured in children living in Gayeu (near a larger town), Saisi (rural) and Tamoyot (remote), respectively. Severe underweight status was observed among 9.0 percent, 8.0 percent and 6.9 percent of children in these communities. Both male and female children are underweight at similar rates. Half of the malnourished cases are children under the age of five. Stunting reflects past or chronic malnutrition. Over half the children observed were diagnosed as stunted. Stunting ranges from 57.2 percent in Gayeu to 63.8 percent for both Saisi and Tamoyot. Almost one-third of the children suffer from severe stunting at rates of 24.1 percent, 27.6 percent and 22.4 percent in Gayeu, Saisi and Tamoyot, respectively. Similar rates of stunting were found in both boys and girls, and stunting was most prevalent among children under five (43.7 percent). Wasting is demonstrated by a sensitive index for current nutritional status. The prevalence of wasting occurs in association with the period of post-weaning (WHO, 1986), fluctuations in food supplies, or the incidence of infectious diseases. The prevalence of wasting is 5.8 percent in Gayeu, 6.3 percent in Saisi and 4.4 percent in Tamoyot. The results also show that girls are more prone to wasting than boys, with infants and young children being most susceptible. The prevalence of children who suffer from both stunting and wasting is 3.6 percent. Malnutrition, in terms of underweight and stunting, are prevalent among children living in the study communities. Moreover, the prevalence of underweight children is significantly associated with morbidity. Stunting indicates that children are receiving a poor diet and improper feeding. Inadequate intake and infectious disease interaction results in poor growth. The evidence of wasting in young children supports the contention that the food supply in the study areas fluctuates, resulting in malnutrition and infection among children. This vicious cycle has been occurring in these communities for a long time. Nutritional status of adults is presented in terms of weight, height and Body Mass Index (BMI). The findings show that the average height is 158.8 cm for male adults and 150.6 cm for female adults. Based on the International Growth Standard, these figures are the same as the reference heights of 13 year, 4 month old boys, and 11 year, 10 month old girls. Both males and females lie on the borderline of lower normal growth. On average, over one-third (33.5 percent) of adults in the study communities are malnourished. Results indicate that under-nutrition in adults is prevalent in Saisi, followed by Gayeu and Tamoyot. Surprisingly, the remote community of Tamoyot shows the lowest rate of adult malnutrition, as well as child malnutrition rates that are midway between, equal to, or below those of the other two non-remote communities. Community location (near town, rural, remote) may not be a good predictor of nutritional status among adults or children. The prevalence of female malnutrition is three times higher than for males. These findings reflect the poor state of health and nutrition among adults and children in the study communities. Womens health and nutritional status is lower than that of men, which places them at greater risk of infection, major reproductive health problems and increased mortality. This situation has arisen at least partly from chronic food insecurity and poor hygiene and sanitation practices. Local diets consist mainly of rice, supplemented with insufficient amounts of animal proteins and almost no fats. The typical diet in many households is insufficient in both quality and quantity, leading to low productivity and poor health. Traditional dietary habits and lack of appropriate information are at least partially responsible for this situation. Of the animal protein sources consumed in rural households, aquatic resources contribute more to local diets than domestic animals or animals hunted in the forest. Aquatic animals are captured for sale or barter to compensate for shortages of rice. Households that routinely suffer from food insecurity in the form of insufficient rice often depend on wild aquatic resources to compensate. A more detailed report on the health and nutritional status in the study area is available. Key sections of this report are included here to provide an overview of issues related to health and nutrition identified in the study area. For a full version of this report please contact simon.fungesmith@fao.org.